I don't know that I would pay £8 (about $10.50) for a magazine I knew nothing about and couldn't even leaf through (since it was encased in a plastic wrapper), but the patterns sold me. Not that I need more patterns. These patterns are ones that I would actually sew, though I have to grade up since I don't think I had an option to buy a different size. The 66-page magazine is not bad either. There are short little pieces with newbie sewing advice - but useful as reminders for seasoned sewers too, both garment and non-garment sewing projects, analyses of some McCalls and Butterick patterns, and one feature article. The sewing ads are also useful and may introduce me to some new online sources. 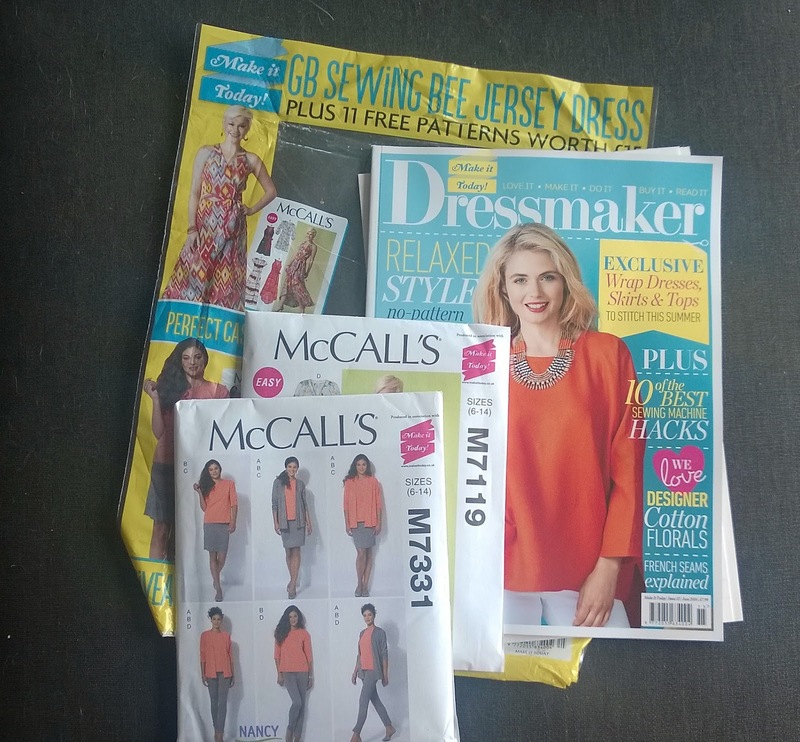 This issue also came with a printed pattern for a jersey dress, which you can also download for free when you register at makieittoday.co.uk. German magazines sometimes have some freebies packaged with them, but not to the extent that I've seen UK magazines. It's fun to buy one every now and then but I do have to watch myself and not buy a magazine just because, you know, free stuff. Free is always good. This reminds me of "the old days" when there was lots of free stuff included in packages, magazines, and other places. Ready to cut the fabric...or am I?